If ever a city was built to be resilient to heavy rains, it is Los Angeles. And yet, El Niño is about to test just how resilient the city is in the short term to flooding, and even more importantly, how resilient it can be to water shortages over the long haul. And thereby hangs a tale about one of the central conundrums of urban resilience in the face of climate change, with implications far beyond the City of Angels. Los Angeles has been preparing for El Niño in earnest since 1938, when a huge flood tore through the city, killing 49 people and causing US$40 million in damage to public and private property (equivalent to more than $500 million today). In response, the city built a massive flood control system: the infamous, 51-mile, concrete-lined viaduct known as the Los Angeles River. Heavy winter storms are not just El Niño’s fault. They are a regular feature of this landscape. The aquatic conundrum is that this water removal system, which guaranteed the city’s ability to withstand big storms barreling in from the Pacific nearly every winter, is now seen as the worst symbol and central cause of LA’s problems with water management, especially in the aftermath of a punishing four-year drought, but even more so looking toward a future defined by climate change. The hard lesson here is that infrastructure systems built to make cities resilient in one era may not serve them well at all in another era. So far this winter, El Niño-stoked storms have been pummeling the Pacific Northwest, but weather watchers see the jet stream moving south, and the first major storms of the winter are drawing a bead on LA this week. The city is as prepared as it can be in the short term. The news media have been announcing El Niño’s arrival for months now. Websites have been set up to instruct residents on how to prepare their homes: clean gutters and drains, stock up on emergency supplies and know where to find sandbags if you live in a low-lying area. Municipalities have cleared major flood control infrastructure of debris. Warnings have been passed out to homeless people living in drainages prone to flooding. Emergency response teams have conducted swift-water rescue drills. Portable concrete traffic barriers called “k-rails” or Jersey barriers have been placed at the ready in canyons often subject to mudslides and debris flows in wet winters. And federal, state and local agencies have convened for “tabletop exercises” to simulate coordinated responses to a big storm event. So with any luck, the worst result of this winter’s storms will be that all the rainwater will swiftly fill the Los Angeles River’s concrete banks to the brim and then flow harmlessly out to the Pacific Ocean, millions upon millions of gallons. But for anyone concerned about the city’s long-term water woes, that will be a dismaying sight indeed. For the times have changed: today, we want to capture as much of that water as we can. In California, we get essentially all of our water in the winter – typically, nearly all of it in just a few big winter storms, each passing through the state in just a few days. Most of that precipitation is stored as snow in the Sierra Nevada until it melts in the spring. Over the past century, the state was plumbed with these basic facts in mind. The “hazardous metropolis” of Los Angeles, as historian Jared Orsi dubbed the city, was made safe for millions of residents by diverting dangerous stormwater runoff directly to the ocean in order to avoid flooding and by importing water for actual use from the Sierra Nevada and the Colorado River. Now climate change threatens to disrupt this system, which is already overtaxed, especially during a drought. Warmer winters are likely to mean less snow and more rain throughout California, and warmer springs with faster snowmelt and runoff. So the whole state of California is going to become more like Los Angeles, shedding water during wet winters to keep from flooding, while ruefully watching a precious resource wash out to sea. There are now efforts under way to try to capture more rainwater locally in Los Angeles and statewide. The drought has renewed calls for building more dams and reservoirs to store runoff. But all of the best sites for water storage were already developed long ago. Ironically, groundwater aquifers depleted by pumping now present the best opportunities for storing surface water runoff, at least in areas where the underground cavities haven’t collapsed because of land subsidence. In Los Angeles, the city’s eponymous river is the symbol of a new vision for a greener, more resilient ecological urbanism. Not so long ago, Lewis MacAdams, a poet and founder of Friends of the Los Angeles River, made a name for himself by shouting “river” whenever anyone talked about the city’s most famous and important “flood control channel.” Now, not just river advocates, but city officials, urban planners, the famous architect Frank Gehry and even the Army Corps of Engineers, which built the flood control channel, see the river as the potential centerpiece of a more absorbent landscape to be wrested from the city’s impermeable asphalt sprawl. 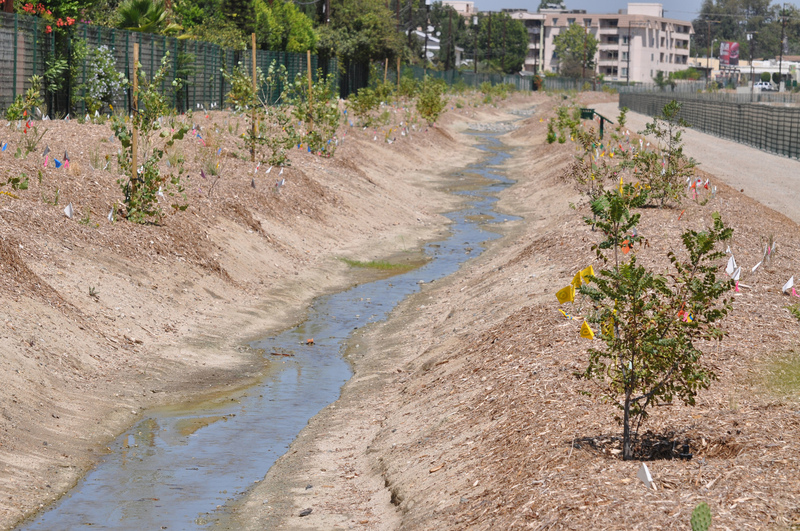 Plans call for reengineering the river, starting with an 11-mile stretch near downtown Los Angeles, widening the channel by terracing the banks, creating side channels and off-channel marshes and establishing riparian, freshwater marsh and aquatic habitat, all while maintaining existing levels of flood risk management. Farther off the river, parks and yards are being landscaped with permeable pavements and swales to slow down runoff and allow it to percolate into the groundwater. All of these efforts will create lasting, incremental improvements to our current water system, while enhancing the environment for people and habitat for other species. But they can only go so far. The rub is in our nature and our history. We live in a city built to weather California’s erratic nature, which could well become even more erratic in the future. And while we might prefer to choose a new kind of resilient infrastructure for this new era, our history has narrowed the options. 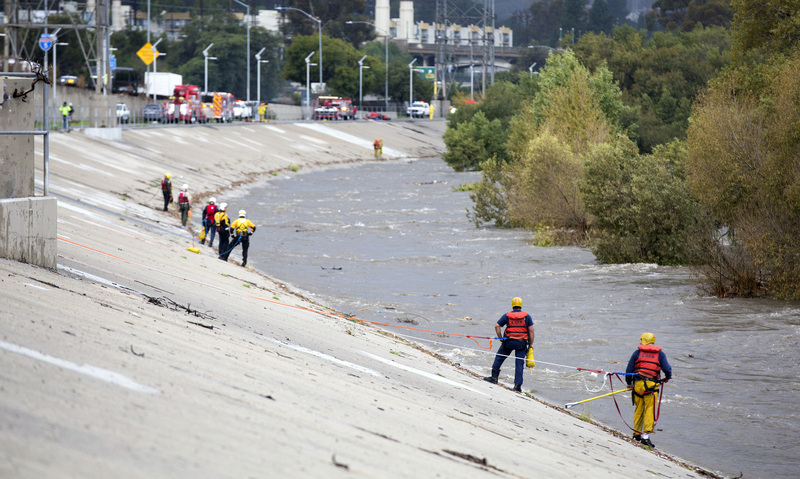 Los Angeles needs the full capacity of the flood control channel only a few days a year. But on those days, the city really needs it. As bad luck would have it, those are exactly the days when the city gets most of its local rainfall for the entire year, the very same water it would like to store for the dry days inevitably ahead. Jon Christensen, Adjunct Assistant Professor in the Institute of the Environment and Sustainability, the Department of History, and the Center for Digital Humanities, University of California, Los Angeles. This article was originally published on The Conversation. Read the original article.